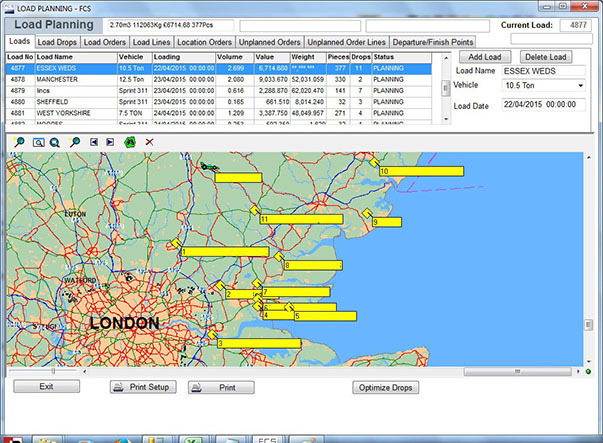 The Distribution Planning Module enables you to plan your deliveries, using loads by regional areas. A visual on screen map of the UK helps you track your orders in transit, at any given time. (The 'zoom-in / zoom-out' facility takes you right down to a street level view. Driver documentation can be printed in drop sequence, together with delivery notes for each load. Facility to set up and select multiple vehicle types, holding different cubic capacity volumes. Orders can be viewed on screen, for any date range selected. Returns and exchanges can also be displayed, with an option to exclude these. Automated postcode validation and address matching features for all customer locations. Items are allocated to load / load number, and optimised for best drop sequence. The route is calculated by mileage / time, to maximise efficiency. Multiple delivery areas can be set up by postcodes, to allow filtering of orders by area, or to view all orders on the map. A quick 'look-up' facility, helps you speedily locate a particular postcode, town or other named places. An unlimited number of drops / calls can be entered within the route. There is a facility to enter and use your own measured standards for road speeds, and the other work associated with deliveries, such as drops, unloading, and Focal Points for Draw Bar Operations. Loads can be planned by cubic capacity, weight or quantity, according to how your business operates, (whilst noting the financial value of each load).